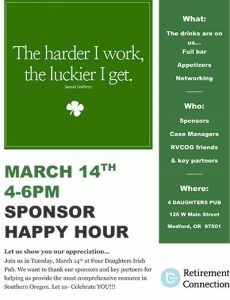 Let us show you our appreciation… We’re inviting sponsors, case managers, RVCOG friends, and key partners to join us Tuesday, March 14th at Four Daughters Irish Pub. We want to thank our sponsors and key partners for helping us provide the most comprehensive resource in Southern Oregon. Let us – Celebrate YOU!!! The drinks are on us with a full bar, appetizers, and networking! ← Alzheimer’s Advocacy Day at the Oregon Capitol!